0:01: Flashback to a young Jimmy/Saul. (Reminder: Jimmy McGill is still the name of the character that will become Saul Goodman. I will call him Saul, though he is still Jimmy in the show.) He is in jail, and his brother shows up as his attorney. Chuck is upset with his younger brother. Saul begs him to get out of the situation. Chuck reluctantly agrees. 0:07: Present day. Saul is at his office/home behind the nails and waxing studio, drinking at 2:00 a.m. He looks at the number Tuco’s boss, Nacho, gave him on a matchbook. Saul calls Kim, a female defense attorney he is friendly with. Her boss got the Kettleman defense case. He is fishing for information on the Kettleman’s money. Kim keeps her client’s confidences, as required by Rule 1.6. He says too much. Kim is suspicious. 0:12: Saul is struggling to share with Nacho, or warn the Kettlemens that he is coming after them for their money. He calls the Kettlemens from a pay phone. He eventually warns them that someone is coming for their money and that they are in danger. They look out their window. Someone is standing in the shadows. 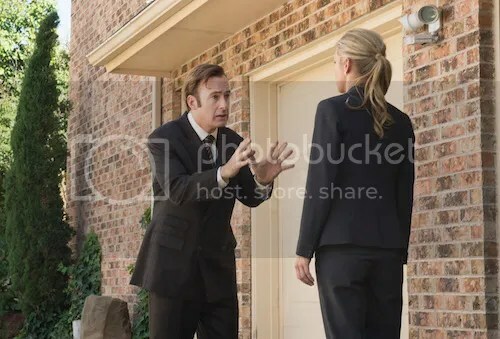 Jimmy McGill (aka Saul Goodman) and Kim discuss Nacho’s innocence. 0:20: Saul is negotiating a plea with a prosecutor while he is in a bathroom stall. After some back and forth, Saul realizes the prosecutor is negotiating on the wrong case. After yelling at him, they reach a quick deal. Saul gets a call from Kim. Something has happened with the Kettlemens. 0:24: Saul yells at Mike because he won’t let him out of the parking gate. Saul reaches in and pushes the button. He gets to the Kettlemens’ home – police are there. They are missing, along with their kids. Kim asks what Saul knows, he denies any knowledge. Nacho told Saul about his plan, but it was not while seeking legal advice. He doesn’t have a duty to keep the conversation confidential. but he does despite the clear potential danger to the Kettlemans. 0:26: Saul drives to a pay phone. He calls Nacho and leaves several incoherent messages. 0:27: A call comes in and hangs up. 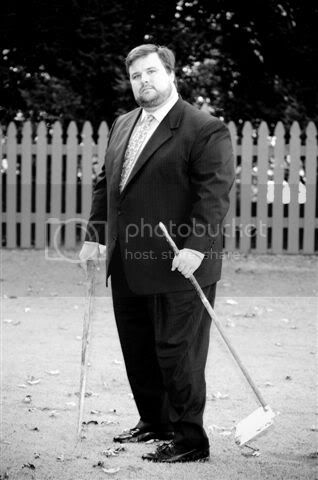 Saul then sees some people approaching the car. He runs, thinking it is Taco’s men. It is the police. 0:31: The police take Saul to see Taco. Taco asked for Saul. He is in an interrogation room at the station. Sautl tells him what he learned from the police. Taco was arrested because of a neighbor reporting Taco’s van. They found blood. 0:33: Taco denies any knowledge of the abduction. The blood is the skateboarding twins. Taco thinks Saul set Taco up and took the score. Taco threatens Saul – get me out today or I kill you. 0:39: Kim tells Saul he can tell them where the Kettlemens are – their immanent danger trumps attorney-client privilege. If Saul could save their life, she is right. 0:41: They take Saul to the house. Saul notices that the little girl’s doll is missing. Saul theorizes that the Kettlemens’ may have kidnapped themselves. Saul tells Kim he called them and warned them. Thinks that caused them to run. 0:46: Saul returns to the courthouse. Mike won’t let Saul in to park. Saul leaves the car and puts his finger into Mike’s chest. Big mistake. 0:51: The police are speaking with Mike about getting Saul to talk about the Kellermans. Using Mike’s assault charge as leverage. “Nacho is nacho man.” Awesome. Mike refuses to press charges. 0:53: Saul asks Mike if he believes his theory. Mike does. Mike explains he is a former cop. He thinks the Kellermans are still in the neighborhood. They are staying close to home, Mike explains. 0:55: Saul returns to the house. The Kettlemens have a camping sticker on the back of their car. Did those stick figure family window stickers exist back then? I think not. Anyway, Saul follows a trails out the back yard. A while later, he finds them camping in the woods. 0:58: While telling the Kettlemens that they are going home, they refuse. Saul and Mrs. Kettlemen pull on a bag. It rips and money falls to the floor of the tent. End episode. Lots of issues involving attorney-client privilege and duty of confidentiality in this episode. The characters even mentioned these rules.